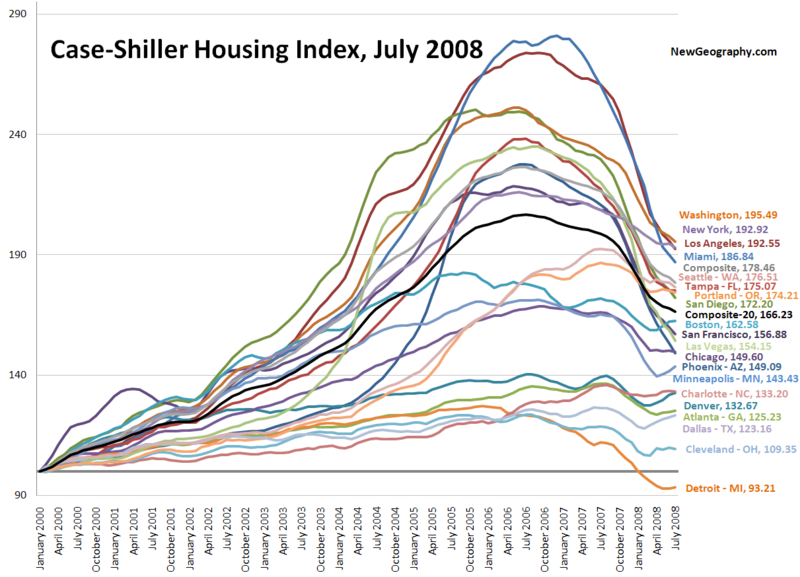 S&P released the July Case-Shiller Index today. Check out our line chart to follow the trend in each market. Click the graph for a larger version. Many of the most inflated markets are still in free-fall mode, but the 20 metropolitan area composite seems to be starting to level off. Markets such as Charlotte, Denver, Atlanta, and Dallas - areas with the most moderate increases during the height of the bubble - seem to be in the best shape. Minneapolis seems to be rebounding slightly after a sharp decline in the last year, but Detroit has fallen below its mark in 2000. How far can prices fall? 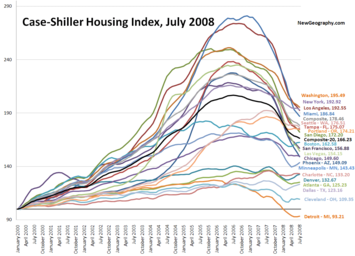 Check out Wendell's take on realistic housing prices. Here's a big version of the chart. The late Jesse Unruh, longtime speaker of the California Assembly, was a giant of a man, both in accomplishment and girth. But he will be forever remembered for having said that “Money is the mother’s milk of politics”. Never truer words were said. We got a good glimpse of that in the recent vote on the Paulson-Pelosi Wall Street bailout. A quick survey conducted by the Berkeley, California based Maplight.Org showed that members of Congress in both parties who supported the bailout received 54% more money from the financial service industry than those who voted against it. The differential among Democrats was even wider --- those who backed the bailout received almost twice as much from Wall Street than those who opposed the measure. A regional analysis conducted by the New York Times showed another interesting pattern, with opposition to the measure strongest in the heartland states, Texas and other places where the housing bubble was less inflated. Clearly constituents in these areas reached some of their representatives with complaints. As for those who went the other way, well, somewhere in heaven, California’s “Big Daddy” is wearing a sly, knowing smile. You don’t have to believe Sarah Palin is qualified to be vice-President, much less President - I certainly don’t - to understand that her nomination has unsettled many people in our big metropolitan centers. The very idea that a former Alaskan small town Mayor being selected for such high office has elicited an outpouring of scorn towards micropolitan and small town America. In reality most Americans, as he points out, live in big metro areas. That’s the level where Brookings, and most of our leading policy commentators, believe political power and decision-making should be concentrated - when Washington is not the preferred option. Yet Bruce and other compulsive centralizers forget that over one-third of Americans still would like to live in small towns or the countryside – roughly twice as many who want to live in his beloved, high-density cities. Migration patterns show that Americans are moving, on net, more to mid-sized and smaller cities, and within the metropolitan areas, away from the central cities. If the benefits of small town living is a “fantasy,” it’s a widely shared one. Even residents of metropolitan areas often regard themselves as residents of their local town or neighborhood. Most local governments remain small-scale, particularly in the vast suburban hinterlands. Few residents of greater Los Angeles, for example, feel an emotional allegiance to the “region,” much less than shadowy Southern California Association of Governments. Instead we identify with Irvine or Burbank, Riverside or Ontario. Even those of us who live within the borders of the city of Los Angeles, tend to consider ourselves residents of Valley Village, Leimart Park, Koreatown or Highland Park. If anything has gotten strong in LA over the past three decades, it’s identification with neighborhoods. Katz and many of his regionalist colleagues would prefer that all of us look to some centralized regional authority for leadership and inspiration. Although regional organizations have their place, the notion of local control will continue to possess great appeal. Even the nomination of Sarah Palin won’t change that. Many of you might know I am a bit of a Houston fan. It's not that they don't have zoning --- I am neutral on that issue --- but because they have heart. I was privileged to see Houstonians open themselves to 250,000 or more mostly poor and minority evacuees from Louisiana after Katrina. It was an inspiring effort and very ecumenical, led largely by evangelical Christians but including Jews, Muslims, Catholics and anyone else who gave down. Now, after Ike, they are taking care of their own, as we can see from a message from Elliot Gershenson to Jeff Mosley (listed at the bottom) at the Greater Houston partnership. Urban greatness has many facets, but if I was to pick one, the kind of generosity of spirit Houston has showed would be at the top of my list. Like so many non-profits, IM has been out of power but still kept going, serving the community. It's hard to believe that it is possible to serve so many seniors and refugees without computer power and phone service, but somehow we have done so. Just as so many other first-responder organizations like the Red Cross, Salvation Army and government agencies like the City of Houston, Harris County and FEMA have stepped up. We'll likely hear stories about failed efforts, but the true heart and guts of our city needs to be recognized. There are so many stories of bravery, dedication and pure visionary action that are worthy of telling. There's the story of dozens of churches and other faith groups who have been housing evacuees from Galveston and other places in their gyms and sanctuaries - providing food, shelter and clothing. Much of these expenses will be borne by them. Certainly the time and talent of their core volunteers and staff is being diverted from other programs - all because the people of Houston are heroes. There's the story about crime - not the one we would expect - but how low the crime statistics have been. People in Houston have learned how to drive! Somehow, with all those lights out, people have slowed down and let the other guy take a turn. I keep hearing that people connected with their neighbors, many for the first time. And now as the electricity is coming back on and the garage openers begin working again, it feels like we're losing something very special. I learned about one church's senior pastor who received a phone call from someone he didn't know living back east. The caller said they could not find their elderly parents and were desperate to find out if they were ok. So this pastor got in his car late that night, with a load of food, water and ice and drove across town to find the parents. He drove up to the house and knocked on the door. They were fine, but without electricity or phone, so he called their kids on his cell phone and said "here, someone wants to talk to you." After the call the parents said they didn't need anything but across the street there was someone who really looked like he did. So the pastor gave all of his food, water and ice to the neighbor. The next day he came back with more food and water only to find that the neighbor had distributed what he received the night before to his neighbors. The church volunteers returned each day until the electricity came back. The president of my synagogue bought Sabbath dinner for 1,250 families who he thought might need a kosher meal. In the end a number of synagogues and the Jewish Federation of Greater Houston backed him up so that he did not need to take this financial burden on his own. Only about 500 families came forward to receive these meals, so in the end he and my synagogue donated enough food to the Houston Food Bank and the Jewish Community Center to feed 700 families and seniors. I could go on - but I think you already know what I am talking about. You've likely witnessed this yourself and have been amazed by the grace that has been shown by Houston and all of our leadership. On that note (about leadership), please let me make a special appeal. Normally this would have been the Tuesday Memo when I showcase the annual United Way campaign which just began. IM is proud to be a significant recipient of United Way funding and we use these funds to serve well over 1,000,000 meals to seniors each year, to make the resettlement of hundreds of refugees the best we know how, and to support our Ready Houston! disaster preparedness and response activities (which has been in full swing these past two weeks). There is no city I am aware of that seems to have the amount of parks and green space it wants. This paucity is particularly glaring when it comes to parks for children and most prevalent in large, dense urban areas. And this is why non-profits like San Francisco's City Fields Foundation are stepping in to upgrade existing parks because public funds are not available in the quantities demanded by the public. On Saturday in San Francisco, the group held a ribbon-cutting for three refurbished soccer fields in the Crocker-Amazon neighborhood. The new fields will add approximately 12,358 hours of playtime on the soccer fields per year. In Great Britain, the National Playing Fields Association has been doing this for over 70 years. Just goes to remind you, that when it comes to building any sort of infrastructure, there seems to be a great organizational advantage to having some sort of centralized body. America, the world's most advanced continental nation, could be on the verge of a great resurgence, much of it based in regions largely unacknowledged by many pundits, academics and the media. What is needed now is an infrastructure strategy to make it happen. So say New Geography contributors Delore Zimmerman and Joel Kotkin in recently released white paper proposing a new method of infrastructure financing for the heartland of America: a Heartland Development Bank. In order to capitalize on emerging economic opportunities and to rebuild America's productive capacity in energy, agriculture and manufacturing enterprises we propose the creation of the Heartland Development Bank. The Bank is envisioned as a $10 to $25 billion source of financing for infrastructure development projects. The Bank would serve as a lead lender on projects of economic significance in the Heartland and leverage considerable co-investment from the private and public sectors. Delore and Joel recently led a round table discussion on financing heartland infrastructure. The discussion is available on Youtube, or check out the case laid out in the policy paper. Michael Lind of the New America Foundation has just published an excellent and inspiring article in Democracy Journal about the need for a new financial and physical infrastructure. "One of the goals of reforming and regulating finance is to ensure that American industry and American infrastructure have access to the private and public investment they need," Lind writes. "Industry, infrastructure, and finance form a system—an American System. And a new American system, well-designed and well-implemented, will be crucial in revitalizing American economic prosperity in the twenty-first century." Lind talks about previous "American systems" of finance and organization that were adopted over time to adjust to the economic realities of the age and how today, we are in dire need of creating a new system that reacts to the new realities we face. Some of these ideas include the creation of a National Investment Corporation and a National Research & Development Bank and the creation of a Department of Infrastructure that merges some of the transportation agencies together. These are bold ideas explained in clear prose with illuminating historical examples. Many of his ideas lend themselves towards centralization and thus remind me of the New Deal a bit. The existence of the Works Progress Administration and the Public Works Administration was one of the rare times in American history when infrastructure finance was centralized. It was also one of the most prolific times in our history for the construction of vital and long lasting public infrastructure that still stands today. Is the heartland the economic armpit of America? ...you will find that small-town America, this legendary place of honesty and sincerity and dignity, is not doing very well. If you drive west from Kansas City, Mo., you will find towns where Main Street is largely boarded up. You will see closed schools and hospitals. You will hear about depleted groundwater and massive depopulation. 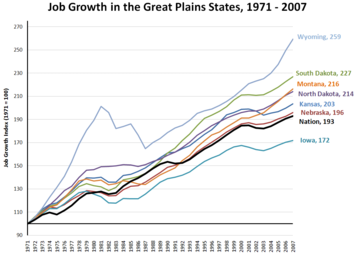 While the windshield tour may yield an array of sorry small towns, much of the mostly rural Heartland has beaten the national job growth rate since the early 1970s. Like the rest of the nation, the heartland of America is urbanizing -- producing many small growth nodes of prosperity. While many of the small prairie towns are dying on the vine, the biggest reason is not "electing people like Sarah Palin who claimed to love and respect the folksy conservatism of small towns, and yet who have unfailingly enacted laws to aid the small town's mortal enemies," as Frank suggests, but rather a combination of larger factors including the re-balancing of 100-year old settlement patterns and the macro effects of automating the ag industry. ...does any thinking person believe Obama’s brief and failed turn as a rural anthropologist will hurt him more than what Republican presidential candidate John McCain said today in Alabama? “We must reduce barriers to imports, to things like ethanol from Brazil, and we’ve got to stop subsidizing ethanol in my view,” Senator McCain said. If the ivory-towered urban elites hawking their tiresome flyover views on cable television each night want to see what a bitter small-town American looks like, they can come to western Iowa during the second year of what we have every reason to expect would be a decidedly anti-rural John McCain presidency. Barack Obama misspoke. John McCain didn’t. Rural Americans know the difference. Burns also correctly predicted Palin's Vice Presidential nomination. What all three of us can agree on is that many rural voters seem to elect candidates who enact policies contrary to their interests. Can Obama make any real inroads with Great Plains rural voters? Newgeography has run several articles about the advantages of small cities. "Why Small Cities Rock" and "Sprawl Beyond Sprawl: America Moves to Smaller Metropolitan Areas" are two of them. For an entire list click on the "Small Cities" tab on the home page.